She's so beautiful. I love her heart <3 I love this drama and the couple supporting them till the end! Love both of you Shin Hye and Yonghwa. Hope to see both of you another dramma. Love forever. job well done to all the crews, staff, and everyone who's involve in the production/filming... you've worked hard! and to all the actors especially lee kyu won (park shin hye) and lee shin (jung yong hwa), ill miss you guys! Sad that this drama has to end so soon. Thanks (Shin Hye) & (Yong Hwa) for giving us such a wonderful drama...*sigh* waiting for the dvd release. and be scratched from watching over and over again. Park shin hye.. ur sooo cute ^^ especially with long hair. and your thank you message was awesome!! ^^ thanks for the hard works on this drama (HS).. more drama to come shin hye!!! <3 Goodluck! Guysss.. watch the ending part of HS!! :)) This evening.. 9:55 pm ^^ lets watch together. kekeke. so, its really ending tonight..how sad but have to move on..i will surely miss HS and the dooley couple..
Shinhye and YH, i was so happy to seeing you two pairing up in HS after YAB....you got me hooked on your drama, your sweet moments captivated me...but its ending tonight so what could i say but good luck to your respective careers..cherish your friendship..i hope to see you in overseas FMs and MBC awards night..
Yong Hwa and Shin Hye just want you to know that we have become friends for about two months already and I am sad to part with you two. Heartstrings gave me happiness, sadness and giddiness that I forgot I still have in me. Your sweet campus moments made many of our hearts flutter just want you to know.I've enjoyed every moment of this drama so I would like to thank you two, the crew and everyone who made this drama possible to look awesome. Aww. So sweet. I really am sad that Heartstrings had to end this soon. My friend even said, "Didn't it just start like weeks ago?" I reeeaaally am going to miss this. Especially her. Good thing there's still Hayate the Combat Butler so I could still continue watching her. I just have to wait for Heartstrings to air here in our country. But still... I really am gonna miss Shin Hye. Especiall her with Yong Hwa. Hope to see them again together. Heartstrings, you had my support even before you started and you will still have my support even after you end. Hwaiting! Awww, Shin Hye is sooo kind and sweet. We enjoyed heartstrings soo much. We will always give our support, that, I/we can promise. HEARTSRINGS always made my day!!!! 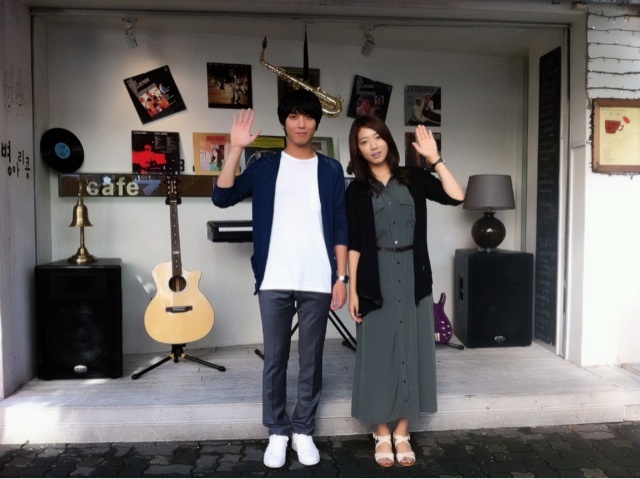 Shin Hye and Yong Hwa are the best! Now, I don't know what to look forward to anymore...oh well, i'll watch the drama again... and again... and again. love the chemistry and got a surprised of yong wha's acting...love to see you both even if i adored jks and psh tandem before. now... kudos to all of you. yong wha is so handsome and manly. got a cute smile and love to behold. and a gentleman too...!!! you got my admiration and you won my heart too as a loveteam! Congratulations!!! I'm going to miss Heartstrings so much :'( When I saw the picture this morning, I got all teary-eyed cause this is finally goodbye. Sigh. Major withdrawal already. The cast and crew did a wonderful job. I'm so proud of Shin Hye and Yong Hwa. They really brought their characters to life. And most proud of Shin Hye for her dedication and hard work even after her accident. She persevere and keep going. So proud and so happy to be her fan. All the best to everyone in the future. great success to come. Heartstrings you are well loved!!!!! Sigh... just watch the last episode online evne though I do not understand Korean. So frustrating to see them separated, they should have stayed together throughout... its just not enough to see them together only at he end!!! Please try to have some special episodes to continue this romance... Maybe they can be real partners in real life too. Great couple! can i say that the director in this drama is really similar to the actual director of this drama because he knows that PARK SHIN HYE KNOW HOW TO MOVE OTHER HEART. COMPLETELY MOVE BY HER. THANKS PARK SHIN HYE AND ALL HER FANS. YOU SO LUCKY TO HAVE SUCH A VERY BIG INTERNATIONAL FAMILY. I Replay Heartstring Everyday . This is The Best Drama I Ever Watch ! coz' i Like the season 1 realLy :) saranghae both of you !